Fawful Theater is an area in Mario & Luigi: Bowser's Inside Story. During the events of the game, Fawful turns Bowser's Castle, but more specially his training area, into his own theater, hosting his own show. When Bowser arrives, the doors are just about to open, with some brainwashed Bowser minions waiting. After some time, the doors open, and everyone enters. Inside the room, there are five rows of seats on each side of the room, with a long red carpet running in between. Then the stage is in front, with many glowing lights and a purple stripe with a Fawful face on it. As Bowser is trying to find a seat to relax in, he discovers there are no more open seats. So, after complaining to the ushers, a brainwashed Goomba comes over to say that Bowser has a special VIP chair waiting. After sitting down, the show is immediately started, with Fawful as the host, saying a special cage match will take place between Bowser and Midbus. Just as he calls Bowser's name, Bowser is flung onto the stage, forced to battle Midbus in a cage fight. After winning, Midbus is dragged off the stage, with Bowser being taken by some brainwashed Boos and Fawful to the winner's feast. 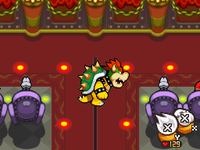 The Fawful Theater retains its role in the game's remake, Mario & Luigi: Bowser's Inside Story + Bowser Jr.'s Journey, and is briefly mentioned in Bowser Jr.'s Journey (although never directly seen). When Bowser Jr., Morton (by that point the only Koopaling to remain with Bowser Jr.), and Kamek discovered that Bowser's Castle had vanished (due to it lifting off earlier to squish Bowser), various brainwashed Goombas state their programmed phrase of welcoming the three "guests" to the Fawful Theater to "take a seat" while also mentioning that there are some temporary technical delays due to the theater being absent. Before the show, a Shroob can be found in a seat on the bottom right. When the player tries to speak to it, it only says "...". Bowser cannot punch or use Fire Breath when the player controls him, but he breathes fire at the Goombas in a cutscene. This page was last edited on January 30, 2019, at 18:02.